I love puff pastry. It's puffy and flaky and reallllly buttery, which is pretty much what I looking for in life. If there is not puff pastry living in my freezer at any given moment, let's just say I feel like a part of me is missing. I use it a lot. Like, in my tortas, which is one of my new favorite things to makes for guests. Also, I love this one recipe from The Hunger Games cookbook, in which the puff pastry is stuffed with venison and sausage and rice--it's a revelation. 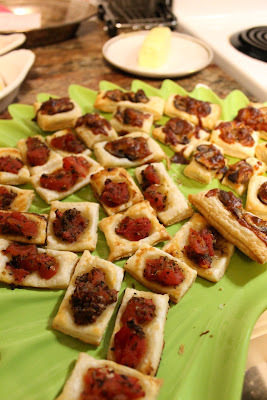 Lately, though, I have been making a lot of puffy appetizers and recently I did some little tiny tartlets. They disappeared pretty quickly. 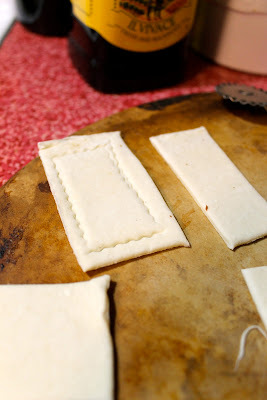 Start with one sheet of puff pastry which you have thawed. This doesn't take long. What I like to do is when I know I am going to use the puff pastry, I take it out and throw it on a pan for about 20 minutes while I do other stuff...like make myself a bloody mary, for instance. In a skillet, you are going to heat a couple of tablespoons of olive oil, add two cloves minced garlic and about 7 mushrooms, sliced. Allow them to brown over medium-high heat while you prepare your pastry. It takes about 5-7 minutes. When they are done, just set them aside until you are ready to use them. The other thing I am using on these tartlets? 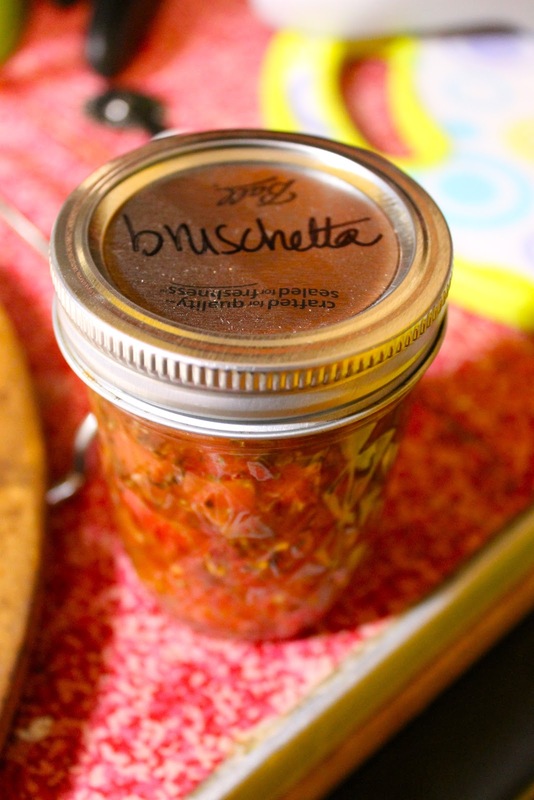 My homemade [canned] bruschetta. You can really use anythign on these that you like. Tomatoes and mozzarella, mushrooms, bruschetta, capers and onions, jam and cheese. Whatever you fancy. Using this nifty crinkle-edged tool I found in my house when I moved in, I made a little "crust" around each strip of puff pastry. This is optional, but I think it's cute. You can use a knife to accomplish this as well, just be sure to take it easy because you don't want to cut through the pastry. Repeat with all you pastry. Somewhere in the middle of all that, my mushrooms had finished, and now I am ready to place them on my pastry. Don't overcrowd your pastry--it's really only supposed to be a bite. I topped the mushrooms with a little shredded mozzarella. 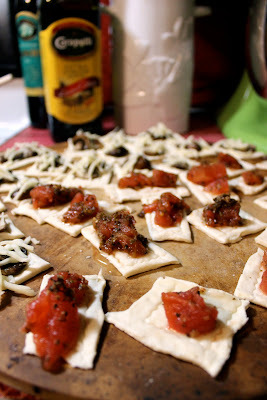 With the other half of the puff pastry, I topped them with the bruschetta mixture. I didn't add cheese because it really didn't need it. Throw them on a platter and watch them disappear. It's like a magic trick you baked! *Keep in mind these are just suggestions of what you could use as toppers--get creative and use whatever topping you like best! 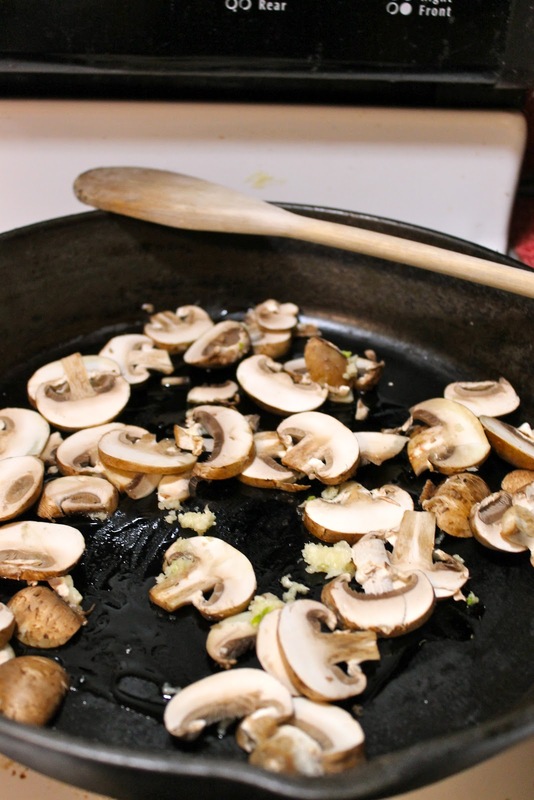 Start by putting your olive oil, garlic and mushrooms into a skillet that has been heated over medium high heat. Allow the mushrooms to brown for about 5-7 minutes or until they are done. Set them aside for a moment, until you are ready to use them. 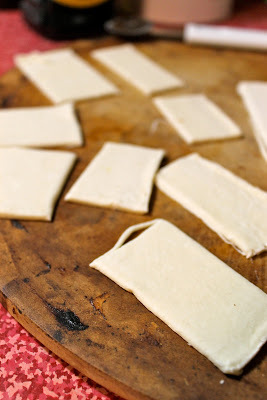 Begin by cutting your puff pastry into strips. They size is totally up to you--I tend to like mine a little smaller. You can use a knife or a pizza cutter to do this. I then made a little crust around my tartlets (see picture above) using a crinkle-edged roller. You can use a knife for this as well. 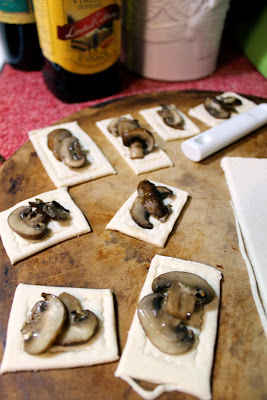 Place a couple of mushrooms on each tartlet. 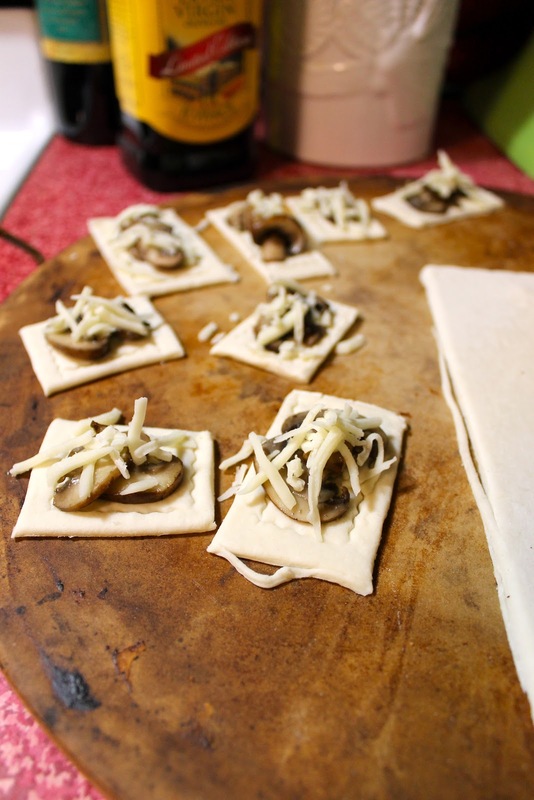 You should have enough mushrooms for about half of the pieces you've cut, depending on the size. Place a few shreds of cheese on top of the mushrooms. 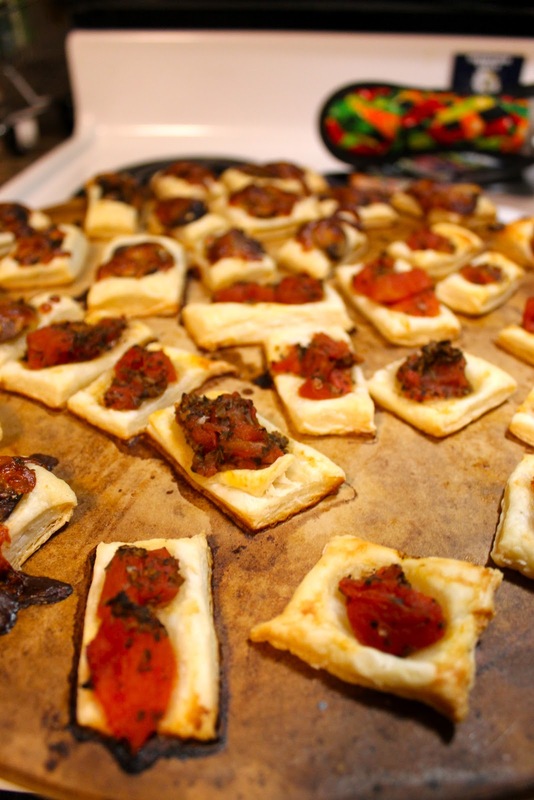 With the remaining pieces of pastry, place bruschetta, tomatoes, and/or other desired toppings on them. 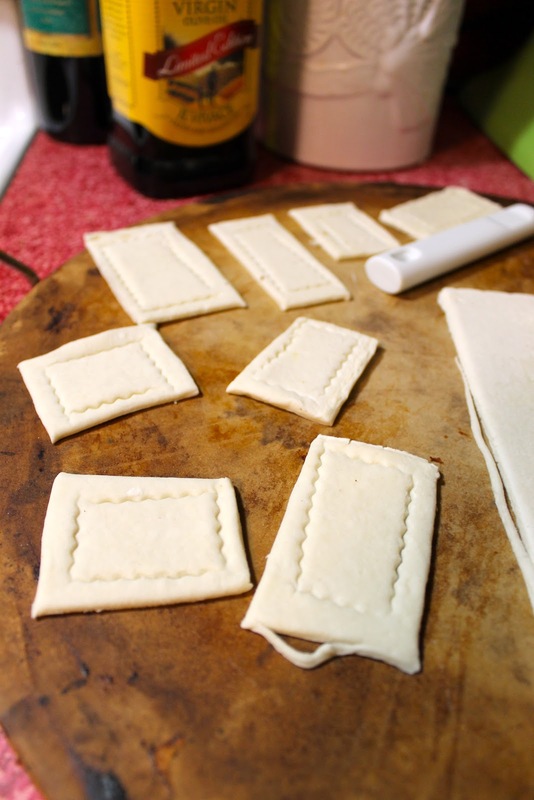 Place them in your preheated oven and bake for 20-25 minutes or until the pastry is golden and flaky. Serve to a hungry crowd and watch them disappear!! !